Jerry Hay has been exploring rivers for many years. He grew up along the Wabash River in Indiana where his fascination and love of rivers began. He has traveled the entire length of the Wabash and White Rivers by canoe and power boat. During those journeys he kept journals and drew river maps. This information, along with scouting the rivers by land and air, have provided a wealth of information that can be found in his guide books. Hay is available as a guest speaker about rivers, river history and river life in general. His talks are very popular with organizations, trade shows, conventions, schools and libraries. His topics are not only about navigation, but also history, geography, and river lore. Jerry serves a a Riverlorian on the American Queen Steamboat. He gives daily talks, serves as a river guide, and makes announcements about interesting sites along the rivers. The passengers are usually on week-long trips on navigable rivers throughout the eastern United States. His expertise about rivers is well known and led to him being called as an expert witness in a case that led to designating a river as non-navigable. He has traveled nearly every major river in the U.S., including the entire lengths of the Mississippi River and Ohio Rivers. One of Jerry's unusual writing projects is a published children's book. The booked titled "A Goose Named Gilligan" was written by Hay about the true adventures of a goose that he rescued and was adopted by him. Another book project by Hay is titled "Beyond The Bridges" and is one of the most complete books about life on the rivers ever written. "Rivers Revealed" was released in June of 2007 by Indiana University Press This edition is available world-wide in soft cover. Hay completed the "Ohio River Guide Book", and was published in the Spring of 2008. This book is a complete guide of the entire 981 miles of the river and is a must-have for boaters, floaters and river road travelers. In 2010 Hay authored the Illinois Waterway Guidebook, that takes boaters from the Mississippi River to Lake Michigan. Two more guidebooks were published in 2011. They are the Tennessee River Guidebook and the Cumberland River Guidebook. The Mississippi River Historic Sites and Interesting Places book is his latest book, published in 2013. Lectures or speeches are actually not the right words for Jerry Hay's talks. They sound rather formal and structured. Jerry has a very informal approach to his presentations. He does not read material or even use notes. He is uncomfortable with a podium. He likes to be with the audience and becomes very spontaneous with his comments. One could listen to the same lecture title several times and hear different information. Humor is certainly part of his style, so that the audience will not only learn from him but be entertained. His river stories are popular with any group audience (not just river related groups.) If a group has no particular subject of interest, Jerry will entertain with stories that will be enjoyed by everyone, with no need to commit to a specific subject. Listed are titles and brief descriptions of some talks available by Riverlorian Jerry Hay. This is a power point presentation showing much of the wildlife in our rivers. This includes what is in the river, on the river, and along the river. Many are surprised how our rivers are teeming with wildlife, with much of it unseen. Hay will of course, include anecdotes that come to mind about a particular species like the story about his discovery that great blue herons lighten their load when they take flight (right over his canoe) or his experience trying to help a large snapping turtle cross a road. This is one of Hay's more serious topics, but it is a serious subject. The Sultana Steamboat was the worst maritime disaster in American history and relatively few people have heard about it. Jerry was part of a documentary on the History Channel about the Sultana. He will talk about the theories on how it happened and his own opinions of what took place, leading up to this terrible event in 1865 on the Mississippi River near Memphis, Tennessee. Everyone has heard of the Titanic disaster but more people died on the Sultana Steamboat than the Titanic. It is a sad story, but one that needs to be told. There is much more to the Delta than most people realize. It is a huge area stretching from Southern Illinois to the Gulf of Mexico. The Delta is not only geologically interesting but also historic. Jerry will discuss the formation of the delta (going back about 70 million years). He will also talk about the history, culture, and the music of the region. From Cajuns to commerce and from natural beauty to the post slavery era, the Delta is rich in history and covered in this power point presentation. Hay has spent a lot of time in the Delta and is well versed about the culture and people of this wonderful part of the United States. Every river has its "Great Flood Of" with a certain year added. Jerry will talk about the rivers within the Mississippi River Basin and their historic flood events. He will discuss when and how they happened and why in some cases, humans have actually created the flooding challenges we face today. This will lead to the story of Turnbull Bend on the Mississippi River. This is a place where the river is trying to change course in a major way, and what the Army Corp of Engineers is doing to try to stop it. If it happens there would be a disastrous impact in the U.S. because the lower 300 miles of the Mississippi River would no longer be where it is. Hay has visited this site and has a good understanding of how it works and whether the projects in place will work. 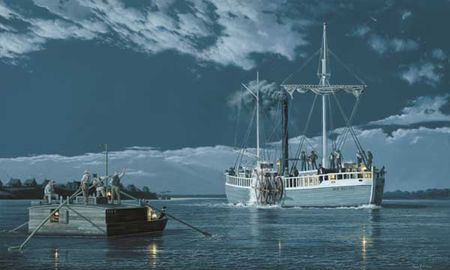 In 1811, Nicholas Roosevelt and his wife Lydia did what many thought impossible by successfully navigating a steamboat from Pittsburgh, down the Ohio River then the Mississippi Rivers to New Orleans. This was the first steamboat to make such a trip and was an amazing journey, not only because of the navigational challenges, but many other factors. 1811 was a very strange year and Jerry talks about all the events that took place while the Roosevelts were on their journey, including the New Madrid Earthquake, a strange comet, plagues, hostile Indians, an on-board fire and much more. This river trip led to the great steamboat era that is an important part of the American heritage. "I never make the same mistake twice...I'm too busy making new ones" is a quote by Jerry Hay. He is referring to his many river adventures, or in some cases miss-adventures. Some of his stories are heartwarming, others are informative, and some are just down-right hilarious. One thing all his stories have in common is that they are true...and clean! There is no doubt that when river rats gather, the rhetoric can be very colorful, but Jerry keeps his talks rated "G" so children can also enjoy his stories. Confessions of a River Rat will give an audience a fascinating look at life on the river, its trials and tribulations, and how one river rat learned some valuable lessons. Contact Jerry for more details on having him serve as a guest speaker and have some fun at your next event. New Orleans is a unique river city that is rich in history and a melting pot of cultures that are unlike any other place in the world. Jerry Hay has spent a lot of time in New Orleans and shares stories and information about the city from its founding to present day. This power point presentation shows much of what the presentation is about, while Jerry discusses the geography, the people, the culture, the history, and interesting places to visit. His focus is mainly on the Mississippi River but he covers much more about this great city from Cajuns to catastrophes and from wars to parades. The audience will also enjoy humorous anecdotes while learning about the Crescent City. The Grand Excursion was a big event on the Upper Mississippi River in 1854 that involved many cities, railroads, steamboats, and even the President of the United States. It was a celebration of an important link to westward expansion and steamboats played a big part in it. In 2004 the Grand Excursion was re-enacted and Jerry Hay played a part in that event. He tells the story of the original event and his experiences (and mishaps) during the 2004 flotilla. He often refers to it as the "wackiest six days on a riverboat that he ever had". Audiences will laugh and learn about this important historical river event. There is no better way to end the day at camp than a storytelling session around a campfire. For your next group camp, invite Jerry to spend the evening around the campfire telling stories that will amaze and amuse. All stories are true and clean, so children will enjoy the storytelling session as well. "Jerry M. Hay, the steamboat company's "Riverlorian," and a river pilot in his own right, is into steamboatin' all the way, and has converted an old houseboat into the Wabash Queen -- his own steamboat. Each morning, Hay holds informal talks about steamboat history, shares river lore with passengers, and cites the source of many common expressions we use today, which had their origin in steamboatin'.Hay is an author as well, having written a delightful children's book titled "A Goose Named Gilligan" -- a story about the goose he managed to free from the mud, with great difficulty, in his native Indiana. The goose returns for visits with him every year. Soon to be released in his newest book, "Beyond The Bridges," which chronicles his travels on the rivers. It takes the reader through all aspects of river life." CLICK HERE TO HEAR A RADIO INTERVIEW ABOUT THE RELEASE OF "RIVERS REVEALED"